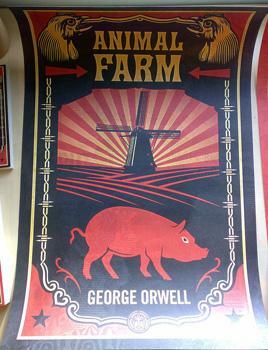 George Orwell's timeless satire of a revolution that went wrong – Animal Farm – and chilling portrait of a totalitarian regime – Nineteen Eighty-Four – have become classic works of Twentieth century literature. With these incredible new Shepard Fairey pop-art covers both books will be rediscovered by another generation of readers. To celebrate these new editions, Shepard Fairey has exclusively produced 200 A2 individually signed and numbered lithographs of both posters. These limited edition lithographs are available with the books for just £100.